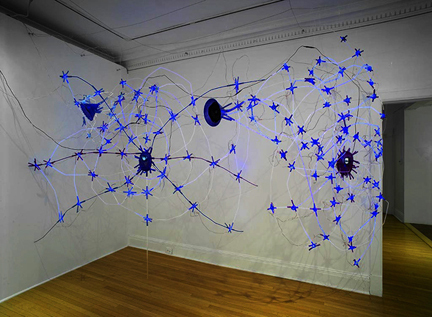 Earworm (palimpsest), 2008, plastic, speakers, LEDs, video. This installation is built around the song for the word “palimpsest” accompanied by a slideshow of my grandfather’s 1965 Italian vacation slides playing on multiple small monitors in two rooms. This piece takes a different form every time it is installed.